Mixing is the process of bringing all your individual tracks together into one unified final product. Because there are so many options when deciding how exactly to do this, this process can be just as important to the overall feel and tone of a song as the tracks themselves. And even though you can use a physical or software based mixer to achieve the same results, here I'm only going to discuss the software based approach. I believe the digital route has many advantages, not the least of which is reducing the amount of hardware needed for adjusting dynamics, reverb, delay, and other effects. The biggest advantage to me, though, is to eliminate another piece of gear that takes up space, money, and sanity in your studio. A combination of art, science, editing, tweaking, voodoo, and black magic... well maybe not those last 2, but you get the idea. They are Faders, Mute/Solo, Pan Controls, and Equalizers. 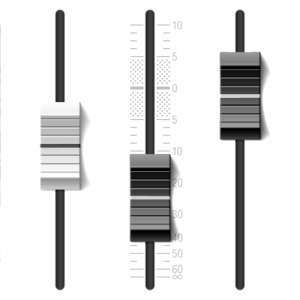 Faders- Remember from our discussion of mixers that these are used to control the output level of each channel. They can be thought of as the opposite of gain (which sets the input level going into each channel). You can control the contribution of each track to the overall mix here. In other words, if you want more vocals just crank up the fader associated with that track and you're set. Mute/Solo- These will become your best friends when auditioning individual tracks and analyzing how they can fit into the overall sound. The "Mute" button allows you to eliminate the sounds from that track from the mix as a whole. This is great for auditioning new ideas and comparing them side by side... once with the track included and again with that track muted. In the same way you can use the "Solo" button to hear only that single track. You can think of this as a "mute everything else" button and you'll quickly become very familiar with it. Panning Controls- are used to define where in the stereo space each track is located. This is a great way to separate different tracks and prevent their sounds from conflicting with each other. Subtle movements of this parameter can have a huge impact on the perceived source of the sound coming from a track. More extreme movements can be used as well of course, and the terms "pan hard right" or "pan hard left" refer to turning this control as far as it can go in the desired direction. Equalization- This is the ability to control the amount of boost or cut for certain frequencies in each track. Like Pan Control, this can also be used to separate sounds from seeming like they are "on top of" one another. EQ is a tricky parameter to use effectively, but like most effects it can have a huge impact on sound with a small adjustment. This is where the value of combining each track in the digital realm really shines. Many popular effects such as reverb, delay, phaser, flanger, and many others can be added to a track with a few clicks of the mouse. In the past you would need whole racks of hardware to have this same capability, but in today's digital recording age we can avoid all the chaos associated with that. The details will be slightly different for each recording software package, but it's as easy as clicking each track and browsing to the desired effect. Effects are a lot of fun and can really add to your project, but the true advantage of the digital mix is the ability to cut, paste, and cross-fade your tracks. I've found that cutting out the "white space" in a track is a great way to reduce the noise in your project. Additionally you can use the cross-fade ability to automatically fade out on a clip of a given track, then fade in the next clip to create a seamless transition. This is great for piecing together a great take from a series of not-so-great takes.